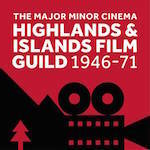 Come and join us for an afternoon of readings, archive film, and rural cinema memories. Enjoy newly-commissioned short works by Alison Miller, Aonghas MacNeacail, Christie Williamson and Kevin MacNeil performed by their authors alongside an illustrated talk on creative responses to cinema memories. Part of the Glasgow Short Film Festival, our event takes place at the Moving Image Archive in the Kelvin Hall on Saturday, 18th March 2017 at 2 p.m. Please note that the event is free but you’ll need to register for a ticket.